Captain Marvel by Peter David Omnibus, Vol. 1 is the #58 Most-Wanted Marvel Omnibus of 2017 on Tigereyes’s Secret Ballot. What Is It? Captain Marvel (1999/2000) was a new superhero title and relatively new superhero launched in late 1999 by Peter David. The series spun out of the events of the 12-issue maxi-series Avengers Forever, itself a spinoff of Kurt Busiek’s concurrent revival of Avengers (1998). 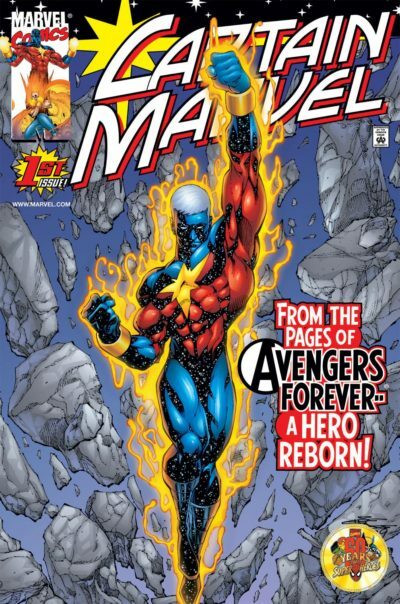 The series revived Marvel’s previously dormant heroic mantle “Captain Marvel” in the most straight-forward legacy fashion possible – by introducing Genis-Vell, the half-Kree/half-Eternal son of the original Silver Age Captain Marvel (who was a colleague of the current Captain Marvel, Carol Danvers). Not only was this new Marvel related to the old one, but he begins his series bonded to the same Earthling host – Rick Jones, the kid who Bruce Banner saved from the Gamma Bomb blast back in the Silver Age (who had been a sort of sidekick and non-hero reality star ever since). Captain Marvel began with a #0 issue in November 1999 and then a #1 in 2000, which is why different guides list it under different years. It ran for 35 issues from January 2000 t0 October 2002, and then relaunched in November 2002 for a 25-issue run to September 2004. It was one of my “50 More Marvel Runs That Deserve an Omnibus” in 2016 and “12 Must-Read Marvel Runs (that ought to be an omnibus) – 1998 to 2008” last week. 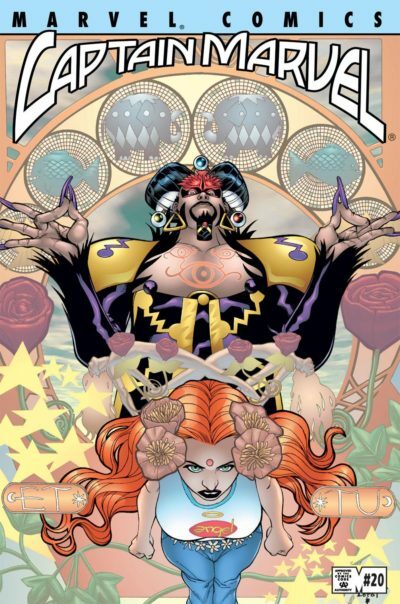 Creators: Written by Peter A. David with the majority of the 2000 series penciled by ChrisCross (AKA Christopher Emmanuel Williams) with Jim Starlin, Patrick Zircher, Leonard Kirk, and others, inks by Anibal Rodriguez (with Walden Wong), colors by Steve Oliff, VLM, and Chris Sotomayer, and letters by Albert W. Deschesne and Wes Abbott (both of Comiccraft). Probable Contents: This book would definitely collect Captain Marvel (1999/2000) #0-26, at minimum. Issue #26 marks Marvel’s (and his host’s) return to earth after a lengthy period in space. 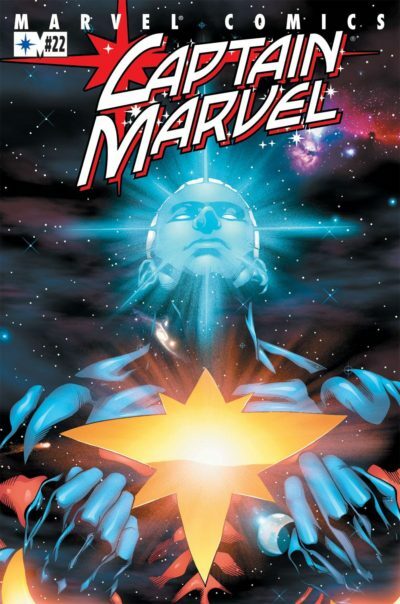 While it could push further to cover #27-35, leaving the complete 2002 series for a second omnibus, there is also an argument for including about a dozen of Genis-Vell’s origin appearances in this volume, which would include Silver Surfer (1987) Annual 6 & #90 (plus the final page of #89), Secret Defenders (1993) #14, Cosmic Powers (1994) #4 (and pages from #6), Silver Surfer Annual 7 (2nd story), Captain Marvel (1995) #1-6, Avengers Unplugged #5, Silver Surfer #122, and material from Avengers Forever (1998) #1-12. Captain Marvel by Peter David, Vol.2 would then collect whatever remained of the 1999/2000 series, as well as Captain Marvel (2002) #1-25 and some story pages from Thunderbolts and New Thunderbolts that resolve Genis Vell’s story. Can you read it right now? Not entirely. In print collections, #7-14 and 17-35 of the 2000 series are uncollected; see the Guide to Captain Marvel for more details. Marvel Unlimited has both the 1999/2000 series and the 2002 series, though it is is missing #26-35 of the 2000 series and does not include all of the lead-up issues from other titles (though it does have all of Avengers Forever). Genis-Vell is trying to settle in to playing hero on Earth while sharing a body with his father’s alter-ego, Rick Jones – frequent sidekick to the Avengers. Jones would probably prefer Genis-Vell to stay dormant, but they keep finding themselves in situations where Rick has to tap together his pair of Nega-Bands to bring forth Captain Marvel – just as he used to do with Genis-Vell’s dad so many years ago. The series finds Peter David unleashed in fine and irreverent form in a title that has a consistent Spider-Man-esque comedic bent. The stories themselves aren’t silly and I wouldn’t necessarily call the series a comedy or even a satire, as X-Statix was in the same time period. It’s just that many of the situations Genis-Vell finds himself in play comedically – largely thanks to the acerbic inner-monologue from Rick Jones, but also due to Rick’s wife Marlo’s penchant for the ridiculous. It’s definitely sillier than David’s X-Factor. David is completely uninterrupted by happenings elsewhere in the Marvel Universe save for a brief flirtation with the “Maximum Security” event. Future Guardian of the Galaxy Moondragon co-stars from the start, with several appearances from her father Drax along the way, as well as Marlo own inner-monologue in the form of a ghost of one of her best friends. The supporting casts of Jones and Genis cross over as the series progresses, which yields some interesting developments between Marlo and Moondragon. David’s run gains an increasingly galaxy-wide scope, which made this one of Marvel’s only cosmic outposts of the early-00s. The second series finds a space-bound Captain Marvel bordering on villainy as he briefly destroys the universe and then fights time-traveling future members of his family. ChrisCross’s pencils are incredibly enjoyable throughout the series. As I reviewed it for this write-up I found myself doing a lot of sitting and staring – not at bold splash pages, but at clever panel work that makes great use of a full-bleed layout. ChrisCross’s characters are rooted in realism but with a certain rubberiness to their features that allows for cartoonish overreactions (especially from Marlo). Part of the strength of the art are the bold colors from Steve Oliff through issue #17. Such a saturated palette with beautiful, inky blues and blacks gives the line work a wonderful depth that pushes past its cartoonish elements. Together the art creates a beautiful starry-sky skin for Genis-Vell, and they draw a devilishly gorgeous Moondragon. Lest you get the idea that the series is a must-read, let me be clear: it’s a lightweight superhero title that is barely referenced when it ends. It takes 10 issues for the plot to advance from a lot of sitcom-esque Earth misunderstandings into space, at which point you realize the reason you were really enjoying the book was the cast on Earth (who are still in the book, but disconnected from Captain Marvel’s story). Yet, the fact that Peter David somehow got away with doing that for 60 issues with such high quality makes this a potentially delightful pair of omnibuses. Will we see this omnibus in 2018? No. 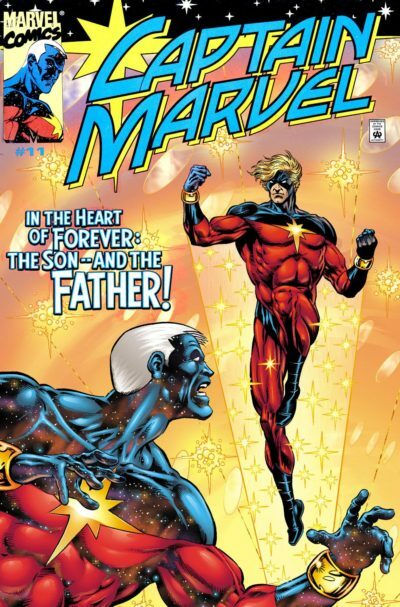 While there are some hints of some past Captain Marvel returning as part of Marvel’s late-2017 “Legacy” event, if that was the case it would likely be Genis-Vell’s father Mar-Vell – the original Captain Marvel. However, I wouldn’t be entirely surprised to see Marvel knock out the 2000 series in a pair of “Captain Marvel by Peter David Complete Collection” books. Would I recommend buying it? Yes, if you like Peter David, Spider-Man, or perhaps Sam Alexander’s recent turn as Nova. If none of those things appeal to you, it’s probably safe for you to to skip. #57 – X-Force by Kyle & Yost– coming tomorrow on Crushing Krisis! I can see this for PAD fans, but not really for anyone else. While I enjoyed a lot of his work, by the time this title was out, I had burned out on PAD’s comics. This title had what I considered his worst qualities. The sitcom type humor undercut any emotional heft. The philosophical themes seemed to overwhelm any actual story that was happening. It didn’t tie into the rest of the MU. And when it was over, it was forgotten. PAD got into a public disagreement with Joe Quesada over the promotion of this title. This resulted in the relaunch, but the whole thing seemed somewhat petty. I would actually rather see a collection of the appearances of Genis before the PAD run. From his appearances in Silver Surfer to his first series by Fab Nic, I find these stories much more entertaining.